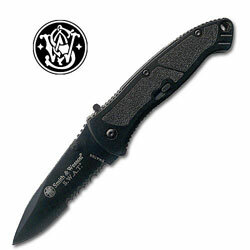 BR The Smith & Wesson Black Small Magic Assisted Serrated Swat folding knife is equipped with a 2 1/2" part serrated drop point blade with Smith & Wesson S.W.A.T. etching constructed of stainless steel with black Teflon coating. The black T6061 aircraft aluminum handle has black Teflon inserts. 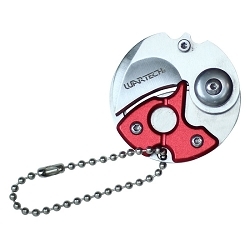 Includes M.A.G.I.C Assisted opening, thumb stud, lanyard hole, and stainless steel pocket clip. 3.3" closed. Weight 2.3 ounces.